Condemning private profit and talking up worker control of factories? That sounds kinda socialist. And socialists don’t win elections in the United States, right? Wrong. 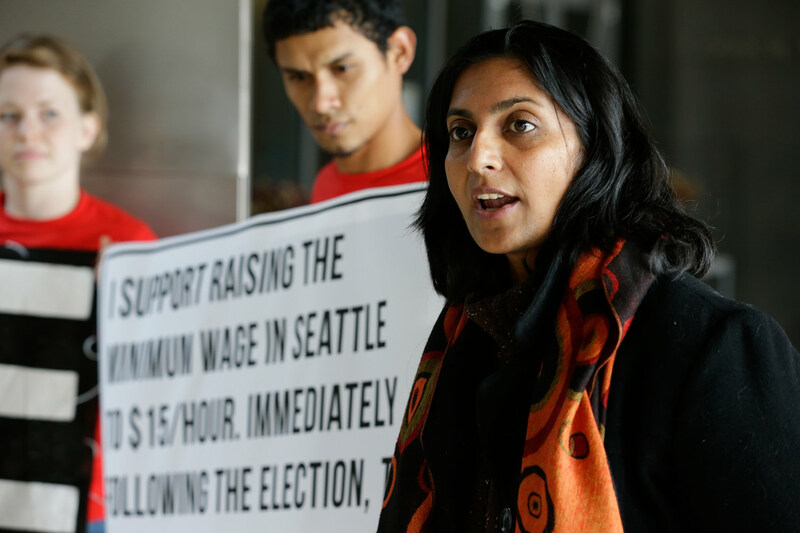 Sawant is the most recent in a long line of “out” socialists elected to city councils, mayoralties and even seats in Congress over the past century. Yet her win drew headlines as far away as her native India. What made Sawant’s victory historic was the context. Since 2008, Republican politicians and their media echo chambers have built a cottage industry around the comic claim that Barack Obama is a socialist. The man who took single-payer healthcare off the table and refused to break up “too big to fail” banks wouldn’t qualify as a mild social democrat, let alone the raging “Marxist” of Rush Limbaugh’s hallucinations. Still, the charge persists. In October, Sarah Palin was peddling the fantasy that problems with the Affordable Care Act website were part of an elaborate scheme to steer America toward “full socialized medicine.” The rhetorical strategy imagines that the mere suggestion of a socialist or socialized tendency is a deal killer. It’s not just Republicans who buy into the notion; Democrats, with rare exceptions like Representative John Conyers and Senator Bernie Sanders, are almost as quick as conservatives to distance themselves from the s-word. But the American people are less concerned. Thirty-nine percent of Americans surveyed for a November 2012 Gallup poll said they had a positive image of socialism. In a 2011 Pew survey, 49 percent of Americans under 30 said they felt positive about socialism, while just 46 percent felt positive about capitalism. Among African-Americans, 55 percent had a positive reaction to socialism, versus 41 percent to capitalism. Among Latinos, it was 44 percent for socialism, 32 percent for capitalism. Even socialists have a hard time agreeing on definitions of socialism, so there may not be a consensus on what all those Americans feel positive about. But in an era of lingering unemployment, cuts to public education and public services, and ever-widening income inequality, it should not be surprising that millions of Americans are ill at ease with capitalism—at least as it’s defined by Ted Cruz and Paul Ryan—and that many of them are open to alternatives. Nor should it be surprising that, after all the silly ranting about Obama’s “socialism,” voters are increasingly immune to redbaiting. In New York City this fall, Bill de Blasio’s Republican opponent seized on a New York Times story that said the Democratic mayoral candidate had once expressed an interest in “democratic socialism”; he attacked de Blasio for running a campaign “directly out of the Marxist playbook.” The New York Post featured an image of the Democrat next to a hammer and sickle. De Blasio laughed the attacks off, continued to describe himself as a progressive and won 73 percent of the vote. That’s not a new notion. The acceptance of socialist candidates and ideas has waxed and waned in American history. With the rapid evolution of our politics in an age of instant communication and growing anger at income inequality, fear of the s-word is diminishing. And voters—especially younger ones—are beginning to demand a politics that, instead of rejecting solutions or candidates based on a label, considers their merits. John Nichols covered Kshama Sawant’s campaign earlier this year.